Featuring updated material, An Introduction to Probability and Statistics, Third Edition remains a solid overview to probability theory and mathematical statistics. Divided intothree parts, the Third Edition begins by presenting the fundamentals and foundationsof probability. The second part addresses statistical inference, and the remainingchapters focus on special topics. 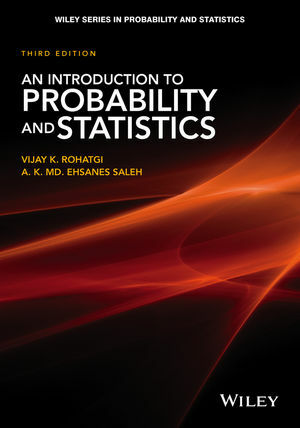 An Introduction to Probability and Statistics, Third Edition is an ideal reference and resource for scientists and engineers in the fields of statistics, mathematics, physics, industrial management, and engineering. The book is also an excellent text for upper-undergraduate and graduate-level students majoring in probability and statistics. Vijay K. Rohatgi, PhD, is Professor Emeritus in the Department of Mathematics and Statistics at Bowling Green State University. An Investment Research Consultant for PRI Investments, he is also the author of several books and over 100 research papers. A. K. Md. Ehsanes Saleh, PhD, is Distinguished Research Professor in the School of Mathematics and Statistics at Carleton University. Dr. Saleh is the author of more than 200 journal articles, and his research interests include nonparametric statistics, order statistics, and robust estimation.